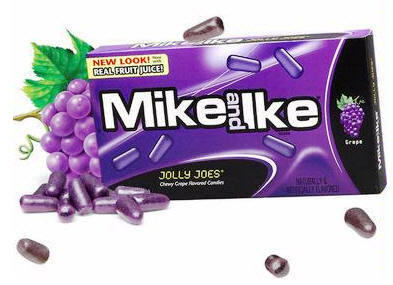 Mike and Ike Jolly Joes Candy 24ct box - Satisfy your GRAPE expectations with JOLLY JOES! Experience the real fruit juice flavor of JOLLY JOES chewy, grape flavored candies. Satisfy your GRAPE expectations with JOLLY JOES! Experience the real fruit juice flavor of JOLLY JOES chewy, grape flavored candies.